1.2 How is this different from all the other approaches we\’ve seen over the years? Why is this not just the latest fad? 1.6 Where do we start in a (state, county, city or community) that wants to do this? Where do we start in one that doesn\’t want to do this? 1.11 How do we do this if the levels above us (e.g. federal, state, county, city) don\’t care and won\’t help? 2.2 What is the difference between population well-being (population accountability) and client well-being (performance accountability) and why is this important? 2.3 How do we get people to understand the difference between indicators and performance measures? 2.6 How do we identify results in terms of everyday experience? 2.9 What do we do if we don\’t have any good data at all? 2.11 How do we create a baseline (trend line) for an indicator? 2.14 How do we finance a results-based plan? 2.15 OK, so what\’s the link to the budget? 2.16 How do we create a Family and children\’s Budget (an Elder\’s Budget, An Environmental Budget) and what do we do with it? 2.21 How do we report on progress? 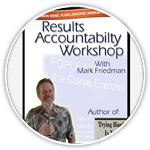 3.1 What are the basic ideas behind performance accountability? 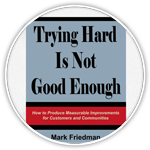 3.6 Where do we start in an organization that doesn\’t want to do this? 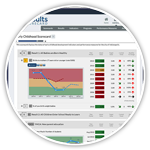 3.7 How do we help people identify performance measures for their program or service? 3.9 What is the difference between the 4 Quadrant performance measures and logic model performance measures? 3.10 How do we identify performance measures for administrative functions like personnel, budgeting, etc.? 3.11 What are some examples of performance measures we can use for my program or service? 3.12 How do we select the most important ” headline: performance measures for my program or service?